Verdict: Thumbs up. I’m not entirely sold on the Axis morality-switching, but the story seems just fine. I’ve got some doubts about the art, particularly in the way that the Blue Marvel is looking whiter and whiter in almost every panel. Okay, it looks like I just don’t have the patience to dig through the convolutions of the plots in these three comics. It’s not that I disliked them at all — they were all pretty good — but there’s lots of twisty-plot things and side-stories and such-and-all going on, and I’m too lazy to mess with ’em right now. The Elf on the Shelf is horrible. So enjoy these photos of rude Elves. President Dwayne Elizondo Mountain Dew Herbert Camacho has an important message for you about feminism. The video about a contest for crappy robots is a bit long, but it’s pretty entertaining, especially if you love crappy robots. I don’t know why some people complain about Common Core. All the guidelines and expectations involve knowledge that’s really important for children to learn. Was Sherman right to burn Atlanta? Hell yeah! And anyone who says otherwise is a stupe. 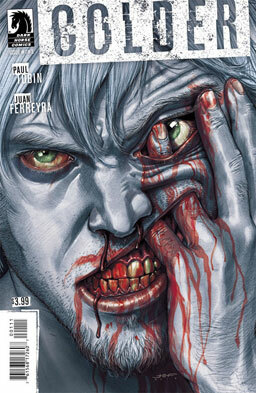 Y’all may recall Paul Tobin and Juan Ferreyra’s wonderful horror series from last year, starring Declan, who can draw away people’s insanity, at the cost of his own constantly-dropping body temperature. They’re all back with a new series — Declan is back, dating his former caregiver Reece, and working as a mental health specialist, which gives him the cover to cure the insane in his special way. 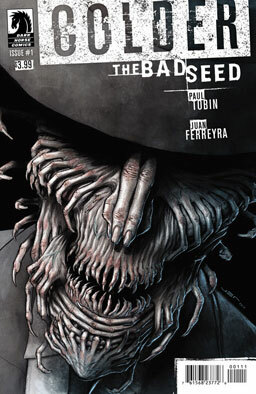 Everything seems peachy-keen — except for a new player on the scene, a tall, grim man named Swivel who has a thing for farming metaphors and fingers — mainly, he likes to cut people’s fingers off, and when we see his true form, he looks — well, take a gander of the cover. What does Swivel intend to harvest? And where do Declan and Reece fit into his plans? Verdict: Thumbs up. A nice, creepy beginning to the new series. Very much looking forward to learning more about Swivel and his various disturbing gimmicks. Lude and Annastasjia continue their stories. Lude tells about his misspent and incredibly horny youth, his stern but concerned guardian, and his quest to find his mother. Anna recounts how she killed off the men who wronged and deformed her, then fell in with the same traveling freak show that sheltered other members of the Nightbreed, until they were hunted down and chased away by frightened humans. But there’s one other important story to tell — the star of the movie, Boone. Spring is coming, the snow is finally thawing, and things are going entirely nuts. More people are sneaking into town, hoping to somehow gain magical or divine healing from the waters in Wausau. Zombie wildlife have started to rise and attack people. 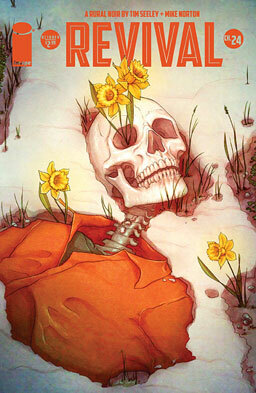 Arlene Dittman, from clear back in the first issue, has finally completely revived, still spitting out excess teeth. We finally learn a little bit about the heavily-scarred Reviver who keeps roaming around murdering people. And Em Cypress has discovered that she may be pregnant. Verdict: Thumbs up. So much weird, wild stuff going on in this issue. It had seemed like some of the mysteries had begun to get cleared up in recent issues, but this one makes it clear that there’s still a lot of scary stuff running around and a lot of secrets waiting to be discovered. Nimble Jack has Declan trapped and paralyzed, rapidly dropping to his deadly freezing point, while he drags him on a guided tour of his own life before he finally cracks his skull open and feasts on his madness. Does Declan have any chance against Nimble Jack? Or are he and Reece doomed to get eaten alive by the villain? Verdict: Thumbs up. Oh, man, I want to spoil so very much of this story, ’cause it’s so very, very good. You know how a lot of horror series start off really great, then never manage to sell the deal at the end? This is not one of them. This one hits on all cylinders all the way to the end. You get creepiness, you get action, you get buckets of gore — including the scene promised on the gruesome cover of the first issue. You even get good characterization and a few precious nibbles of humor. I’m going to trust that y’all have been reading this entire series — but if you haven’t, you’d better keep your eyes peeled for the trade paperback. 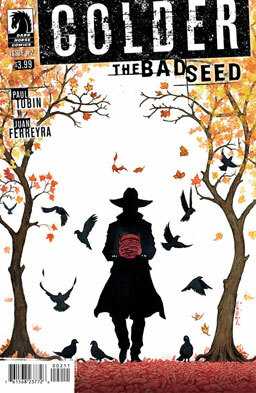 If there’s any justice, Paul Tobin and Juan Ferreyra are gonna win some awards for this one. Hellboy is rescued from another tight spot by the mysterious figure who has aided him before, and this time, he learns his benefactor’s identity: Sir Edward Grey, Witchfinder. Grey reveals how he disappeared from history and how he ended up trapped in Hell — and he offers Hellboy a chance at freedom and a new life. 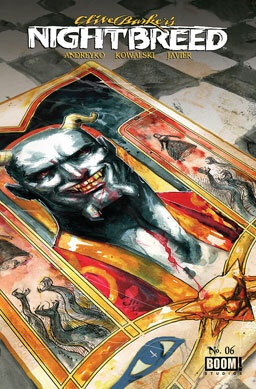 Can Hellboy take the bargain? Verdict: Thumbs up. 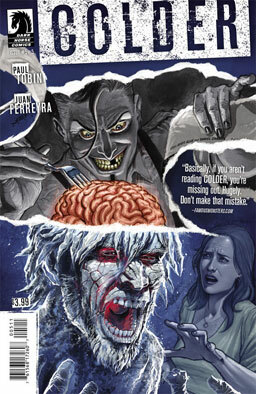 It’s really great to see Edward Grey again — I really enjoyed his previous series. I don’t know if this is the last issue of this series — if it is, it’s not a bad place to leave Big Red. If it isn’t, I’m looking forward to seeing what happens next. Wow, it looks like Random House has decided they want to start cheating authors to try to earn a few extra bucks. Here ya go, writers — here are Pixar’s rules for storytelling. Here’s a creepy bit of music composed by a five-year-old kid — and designed to be read backwards. Nimble Jack has kidnapped Reece into the dimension of crazy, and Declan has to find a way to get her out, all while making sure his body temperature, which drops every time he uses any of his special abilities, doesn’t fall below zero, which would be the point where he dies. He hitches a ride on a passing dog-phobic nutcase to track her into the other dimension, but runs into plenty of problems, including a horde of hellhounds, gigantic monsters, and Nimble Jack himself. Can Declan find Reece? Even if he can, will either of them be able to escape? Verdict: Thumbs up. Brilliant imagery in this series — the design of the hellhounds is great, and the monsters formed of fingers and fangs are also magnificent. The characterization is good, too. 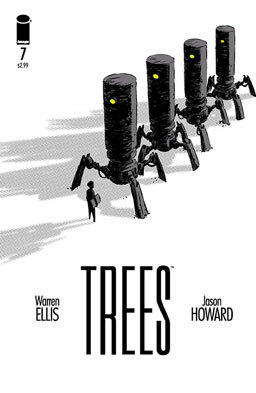 The action is alright, but what this series does so well is weird horror and paranoia. Paul Tobin did some really interesting research on this project — check out some of it here. 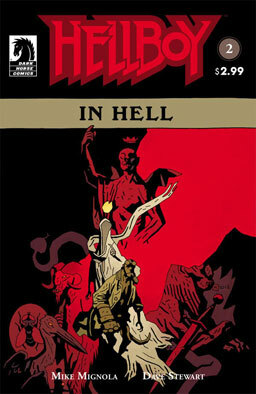 Hellboy is, well, still stuck in Hell, learning more about his demonic family. He learns that his father, as punishment for creating him and giving him the Right Hand of Doom, has been frozen in a block of ice for millennia. He tangles with two of his brothers, intent on killing him, cutting off his hand, and claiming it for themselves. And he learns that he might’ve killed someone very important, and messed things up really badly. Verdict: Thumbs up. 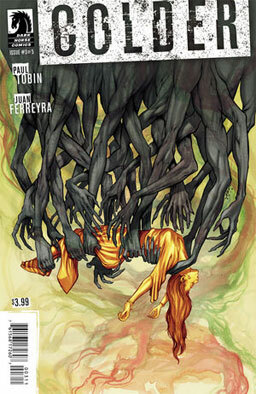 The story is ominous and spooky, with Hellboy finding himself way over his head. 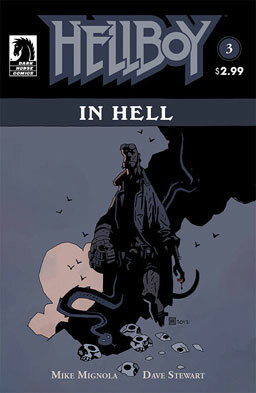 And again, the real selling point for this one is Mike Mignola drawing Hellboy, so yeah, probably worth picking up. We just got done talking about DC and Marvel using their phony-baloney trademark to quash competitors who don’t have money to fight back. Now the thugs at Games Workshop are doing the same thing, claiming they own the trademark on any use of “space marine” — but only when it means they don’t have to sue E.E. “Doc” Smith, Robert Heinlein, James Cameron, or id Software. It’s always good to hear when any of Fred Phelps’ kids escapes from the modern Hell of Westboro Baptist. Yeah, the comics industry has a severe diversity problem. A board game cafe? Yes, I’ll have one, please. This is the first time I ever wanted to watch Bob Newhart’s old “Bob” sitcom. When Dinosaurs ROCKED the Earth! Hellboy continues his trek through Hell, guided by a trio of spirits — who may not actually have his best interests in mind. He is shown the seats of power, which he insists he will never accept, they offer him the chance to murder Satan himself in his eternal sleep, they show him the damned as they are forged into Hell’s army, and they show him his conception, his birth, and the creation of his Right Hand of Doom. What revelations lie ahead? And what temptations? Verdict: Thumbs up. I’m really enjoying the history and the heavy gravity of what we’re seeing in this story — but I still gotta say, I’m most enjoying seeing Mike Mignola drawing Hellboy again. That don’t happen much anymore, and it’s a glorious thing to behold. 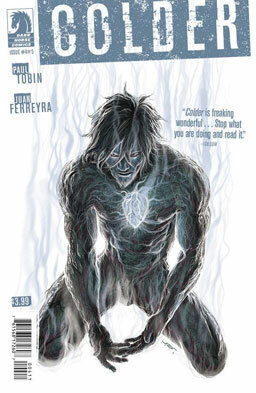 Nimble Jack is on the trail of Declan, the ice-cold immortal, and Reece, his former caregiver. He wants to drive Reece insane, then eat her soul — and she and Declan are the only people who can see him. Declan drags Reece back into the world inside crazy people to escape, but Nimble Jack is able to follow them there, too. Desperate for a way to get away, Declan uses his abilities to make the crazy people around him even crazier, so Jack will eat them instead, but that ends up causing too much upheaval and wrecking the crazy world around them. They escape back to the real world… but it was never a real escape at all. Reece may really be crazy now, giving Nimble Jack a surefire beacon he can follow back to them. Verdict: Thumbs up. Nicely disturbing stuff all over this issue. Colossal surrealism and suspense, too. You can hardly blame Reece for feeling crazy, ’cause reading through this comic will make you feel a little unbalanced, too. Cats that look like pinup girls. Might be a bit NSFW, but you should probably look anyway. There are actually people who believe a literal zombie apocalypse is something that could happen. Which is to say, I suppose, that crazy people are everywhere. Robots playing heavy metal. Also: a four-armed drummer. Yes, this is amazing. Here’s something we don’t see often enough anymore — a comic written and drawn by Mike Mignola. 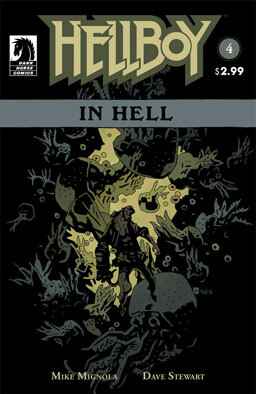 Hellboy is dead, and like all good demons, he’s ended up in Hell. While one demon tries to beat him to death (again) with a hammer, a warlock tries to defend him, and a puppet show performs Charles Dickens’ “A Christmas Carol,” Hellboy tries to make some kind of sense of everything going on around him. Verdict: Thumbs up. 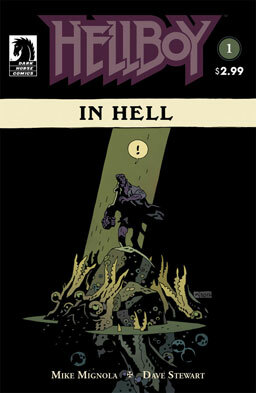 It’d be a thumbs-up just for Mignola’s wonderful artwork. 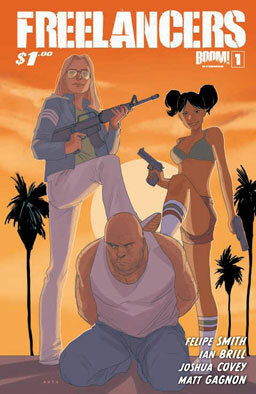 But the writing and action and humor are all primo, so there’s another reason to go get it. 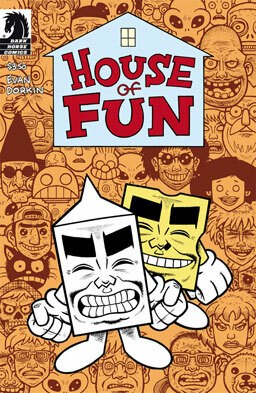 Evan Dorkin throws a whole lot of funny strips in here, including Milk and Cheese, The Murder Family, The Eltingville Club, and a huge number of short newspaper-style strips. No, I’m not telling you more than that — it’d spoil all the fun. Verdict: Thumbs up. Ye gods, like I should have to tell you Evan Dorkin is funny? Go get it, you mooks. 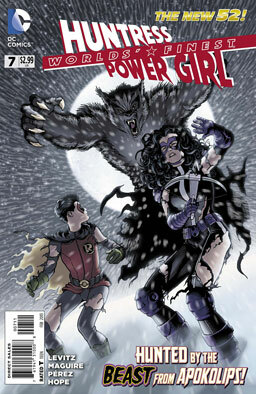 Well, at least it doesn’t have another cover as gross as #1! Okay, that’s damning with faint praise, and this is actually a very nice comic. Declan is walking around and talking like a normal person, which freaks out Reece, the nurse who’s been his guardian for the past few years. And what really freaks her out is when Declan uses a crazy street person to give her a glimpse into what the world looks like for people who are insane — a mad Jenga game of skyscrapers and monsters — and he gives her a look at what his life used to be like in the asylum. Meanwhile, Nimble Jack drives a fairly normal agoraphobic completely ’round the bend so he can feed on her madness. While Huntress and Robin fight off deadly wolves from Apokalips, Power Girl has to deal with a bunch of child soldiers armed with Apokalips technology. Not really a lot more than that going on in this one. Verdict: Thumbs down. The art by Kevin Maguire and George Perez is still gorgeous, but this feels like a series that isn’t really going anywhere. Is DC Comics trying to run off all of their non-racist, non-sexist douchemook creators and readers? Are they, in fact, going to offer work to Tony Harris next? After getting rid of Gail Simone and Karen Berger, how close are they to turning their workplace into a complete sausage-fest? Well, there we go, ain’t that something to wake up to in the morning? If there’s a prize for the Most Beautifully Well-Done Yet Least Pleasant To Look At comic cover, I think this one has a shot for first place. 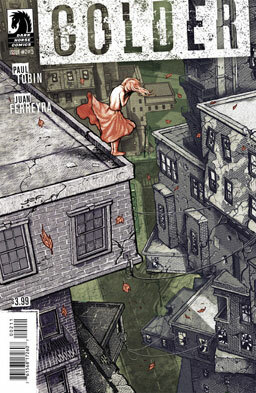 From there, we jump forward to present day Boston, where Nimble jack makes his way into another mental hospital, persuades an inmate to hang himself, and then eats his soul. So here’s Val and Cassie — best friends, orphans, martial artists, and freelance bounty hunters. 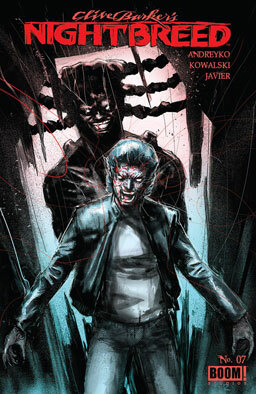 They start out on the trail of Lobo Ramirez, a stylish crook with a stylish wildcat, before they lose him (but nab the wildcat) then get tossed off the case by their boss, in favor of a Katherine Rushmore, a high-profile freelancer and rival for the girls. But they get an inside tip on where they can track down Ramirez — but they’ll have to fight their way through his entire crew first. Why is a simple job getting so dang complicated? Verdict: Thumbs up. Appealing characters, good action, excellent humor, and an actual fer-realz mystery. Cheesecake? Yeah, there’s a little of that. 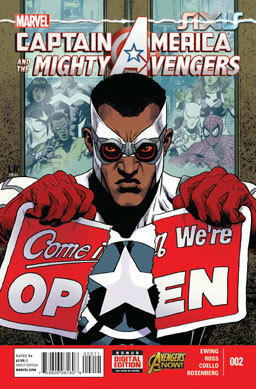 Most of the emphasis is on action, humor, and character, though, so this comic feels like a winner to me.